Cologne is one of Germany's most attractive cities. It has some of the most amazing historic buildings that create a backdrop to a warm welcome from the friendly people who live there. The city is located in the federal state of North Rhine-Westphalia just a few short hours away from the Belgian and Dutch borders. For those moving to Cologne from the US, your household goods shipment will be directed through the port of Bremerhaven. From there, your personal effects will be cleared through customs by our receiving agents and then delivered to your final residence. In the instance that you would like to pick up your shipment yourself from our agents warehouse, you will have that option as well. You should discuss this with your Schumacher Cargo sales person when booking your move. However, the majority of our clients moving to Cologne choose to have their household goods delivered to their new residence and unloaded by our agents. This journey takes between 3 and 4 hours. The time frame can change and it will also vary depending on whether your household goods are being moved directly or via our agents warehouse. One of the first steps to getting settled into your new home in Cologne will be to apply for a residence permit. The second major step involves registering at the city's residents registration office. It's important for this step to be done within the first week after you've arrived. Luckily, the city has 9 locations for the registration offices, called an Einwohnermeldeamt. Visit Meldebox.de for additional office locations. Like most major cities Cologne has multiple police stations and hospitals in case of an emergency. The police headquarters are centrally located with multiple other precincts across the city. Cologne offers many options for medical needs and the majority of which are located a little outside the city center on the western side of the Rhine. Here is the information for the University Clinic, which is located in the Lindenthal district. Almost every part of the city is accessible via public transportation whether it's by taxi, tram or bus which can be a different experience for someone moving to Cologne from the USA. You can visit many of the local attractions including the Altstadt, museums and world famous Cologne Cathedral by using their WelcomeCard. It costs less than 10 euros and you'll be able to use all forms of public transport. For those of you that would like to see the city by car there are multiple rental services available. Getting settled into your new home should be an enjoyable experience, so let us do the hard part for you. 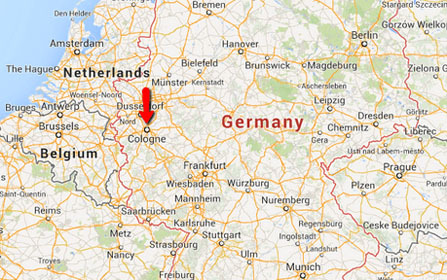 We can help you ship your household goods to Cologne and provide you with a great relocation service. Get a quickFree Moving Quotenow! The work week in Germany actually includes Saturdays. Many Germans own vehicles even though they have one of the best transit systems in the world. They love their vehicles! There are more than 150 castles in Germany! There are a few that contain aristocrats but most are hotels, restaurants and ruins. Germany has over 300 kinds of bread! Germans love their beer. They rank second in the world for beer consumption. It is cheap to buy beer in Germany but deciding is a different matter. There are 1,500 types of beer!